This year is starting with some exciting changes for my blog. As you know, I am going to share more useful links with you. Well, this is not all. As a translator specializing in tourism, I often translate very interesting texts about places of interest in different countries. Then last year I really fell in love with the blog hosted by my colleague Olga Tkachenko. She lives in Siberia and writes about her region with great love. Olga's blog reminded me that Russia is full of stunning places. And it gave me inspiration to share something very important with you. The love for my city, Vladimir, which is by the way a great tourist magnet. It used to be the main Russian cathedral, before Moscow became the Russian capital. It is beautiful. Besides, there is a beautiful park around it. Oh, I forgot to say that it's a working church, and there's a monastery not far from it. Ladies, don't forget a long skirt and a cover for your head if you want to attend an Orthodox service (men don't have to think about such things, lucky them!). But they also have special hours for tourists and you don't need any special clothes then. 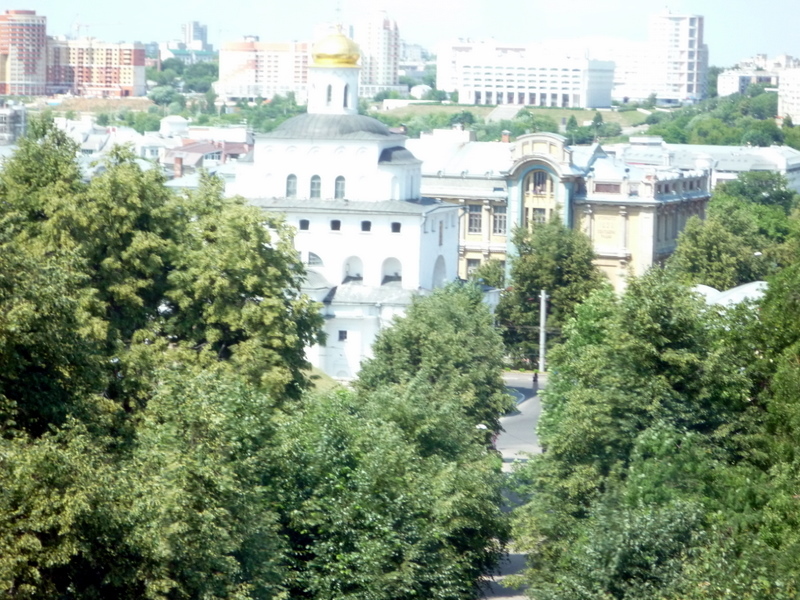 This is the same Assumption Cathedral and its park. The picture was made from another park called Patriarch's Gardens (Патриаршие сады). This picture of the Golden Gate was taken last summer. In the Middle Ages there used to be several gates into Vladimir. But only the Golden Gate (the main entrance) has stayed with us through the ages. It is not just beautiful from outside. There's an exhibition inside, too! There you will see a panorama of the Mongol destruction of the city in the 13th century. The rest of the exhibition is mainly dedicated to the wars that Vladimir citizens took part in. You will also be able to see the Russian armour of different ages and the soldiers' clothes. This is also the Golden Gate. I am standing on the remnants of the fortification walls, now called Kozlov Val (I hate this picture of me, but the Golden Gate looks really good here). It's a shame, but after looking and looking through my photos I realized that I don't have ANY pictures of this architectural masterpiece, so I borrowed the picture from this website. You can read some interesting facts about St. Demetrius Cathedral there. Sad to say, the Cathedral was greatly damaged in the Soviet times. Sometimes we hear news that it is open for tourists, but when I come to find out if it is true I always find it closed. The restoration specialists keep working on preserving this wonderful monument. They say that it has some of the best samples of ancient frescos inside. I hope that one day we'll be able to see them with our own eyes. Of course, the list of interesting places in Vladimir goes on and on! These are just the main three tourist attractions since they are included into UNESCO World Heritage list! This year I will publish more posts with the city views and will do my best to share more interesting info with you! Wow, Olga, this is nice! I've been actually waiting for you to write something like that, because Vladimir is definitely much more interesting than Novosibirsk, just because it's much older. St. Demetrius Cathedral looks great! I think I could change my plans for the summer vacation and take a tour of the Golden Ring instead of a visit to Europe. Such a tour of Russia is a must, I suppose, for all Russian citizens to learn their history and for foreigners who want to know real Russia from the very beginning. 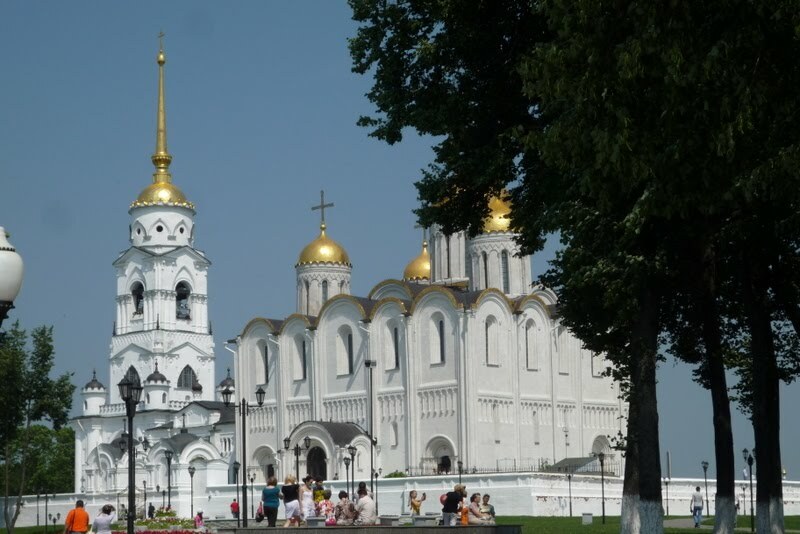 My husband was in some small town near Vladimir on a business trip, but he stayed in Vladimir just a couple of hours and he didn't see much, unfortunately. Thank you Olga! 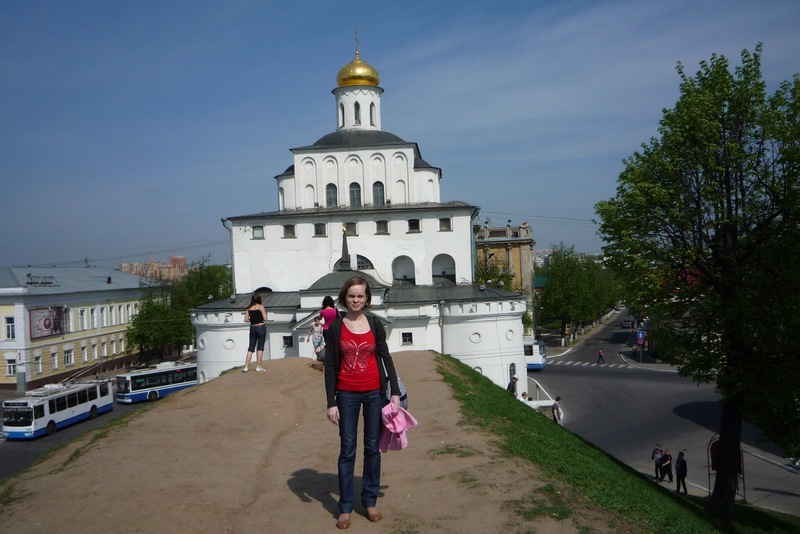 If you ever decide to visit Vladimir please write to me! 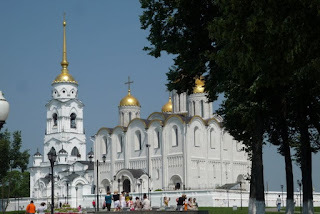 We could have a walk around the historic center of the city or even go to Suzdal together! It's only about 30 minutes drive from Vladimir. 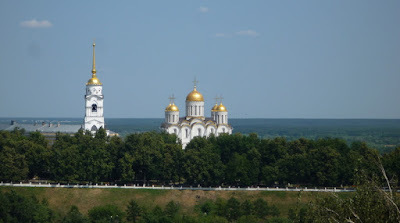 I'm planning to show Suzdal to my daughter next summer. She was there once for my niece's wedding, but didn't really see much. So I'd love to return there. Its monuments made of write stone are also in the same UNESCO list. I think your daughter will be delighted. You are so lucky, a lot of interesting places are so close to you. Here in Siberia everything is so far away. Tomsk, the closest city to Novosibirsk in the northern direction, is 240 km away. Barnaul, which is in the south, is 200 km away. In both cases it is 3-4 or even 5 hours drive. Wow, that's really far away! By the way, my father used to fly to Barnaul on business trips very often. He was born in the Far East, so he loved the North. Here everything is much closer, though Moscow is about 180 km from Vladimir, so we don't go there very often (in fact, I haven't been there for 1.5 years! 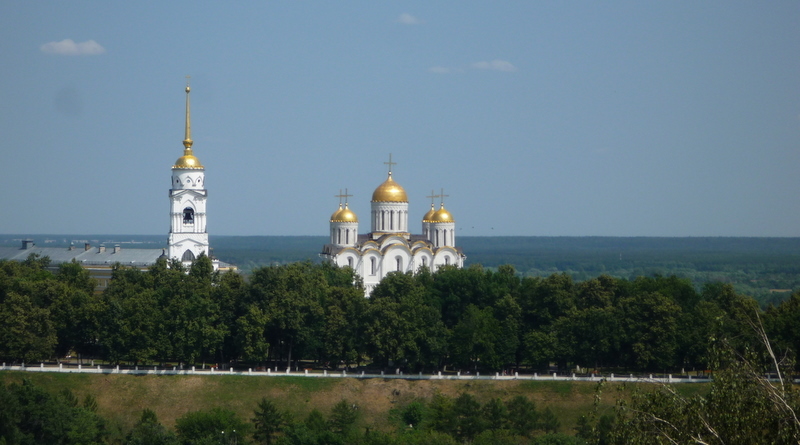 )But we do have Suzdal, Bogolyubovo and other smaller towns pretty close by. In fact, Bogolyubovo is within a walking distance from my home. Update: I was able to see the inside of St. Demetrius Cathedral this spring!The exposition is not large, but it surely is worth your attention! You can learn more about its history, look at the 12th century frescos and other interesting objects inside.